Paisa beer is really Pilsen. 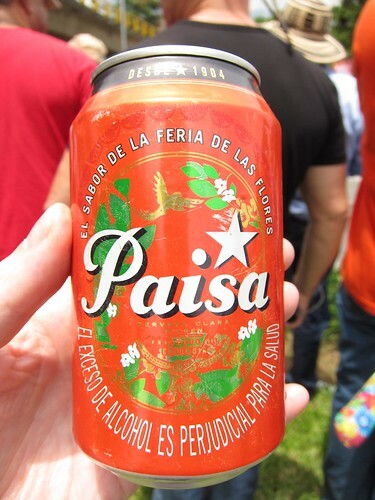 The beer company changes their can and bottle designs every year for La Feria de las Flores. No matter how much Spanish you learned in 10th grade, or how long you’ve lived in a South American city, when you pick up and travel to a new place, you will be confronted with new sayings and phrases particular to that country, region, city and culture. (Como estas) Bien o no? I can’t wait to get home. I’m unlucky (salty like a fish). To be really close to something or to be a hair away from something. e.g., Marce esta a un pelo de la boleta de libertad. Marce is so close to freedom. To be rational, use your wits. e.g., El no esta en sus cabalas. He is not of right mind. To be really sure, something that is fixed. e.g., Will Camilo be late? Si, a la fija! Yeah, of course, he is always late! No way! Don’t even think about it. I am hungover, taken from the guayaba fruit. When someone is full of himself or egotistical they say that he cannot fit into his clothes. What’s your favorite paisa slang? Haha. Great article Jessica. I have just been inundated with “bien o no” recently. The first few times I thought it was a question… like I could answer “no” and continue on with the conversation. But basically I discovered you just say “bien” or “todo bien” instead to not make things too difficult. I also like “Tonc, parce” which is short for “Entonces, parcero”, or basically “what’s up dude”. The young people I met used the phrase –que mas pues?–often> Exactly I’m not sure what it means. Great post!! it can be very usefull for “gringos” since it’s not standard spanish but really common in Medellín. In recent months “bien o no?” has been prominently replaced by “bien o que?”..